I have picked up a paint brush again – the first time in ages – and painted (apples). Looking at the apples – I mean really looking at the apples – made me realise how many colours are actually in an apple. I purchased a recent inspirations magazine which caught my eye – especially an article about Gary Clarke and a project which was embroidery on organza. I have linked here to Gary’s bio on his web site. Take a moment to have a look around and you will see some organza embroidery. Gary is an interesting designer, an innovative embroiderer (definitely outside the box) and an encouraging teacher. I had the opportunity to do a ‘whitework’ workshop with Gary a number of years ago and was very happy with the result. Anyway – thinking out loud – I reckon that Gary’s technique in the Inspirations magazine will be an interesting way to embroider some apples. In the magazine article Gary embroidered a hummingbird using variegated thread, French knots and straight stitches. The variegated thread may be the way to get the varied colour of the apples I painted. Pointillism with thread? Also, Gary raised the embroidery so there is depth. More thinking out loud – it occurred to me that I should look at crab apples - there is a large planting of crab apples near where I live and I will keep an eye on them as they grow to see what I can do. Perhaps I will try and document the trees over a year? What else have I been up to? 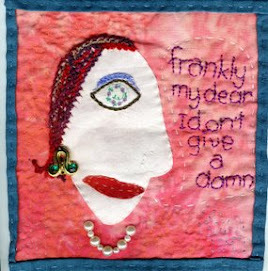 I went to a machine embroidery workshop run by Susan Barker and have been told I need to love my machine. Susan is right of course. I will never get anywhere being afraid if it and I need to leave the machine out and play a bit more rather than just use it to run up a straight seam. Anyway, I have to say I learnt heaps including that I can use thick thread in the nonadjustable drop in bobbin ... came a way very happy knowing that. And I learnt quite a few other things as well. I will have to try and work up some apples on solvy now!